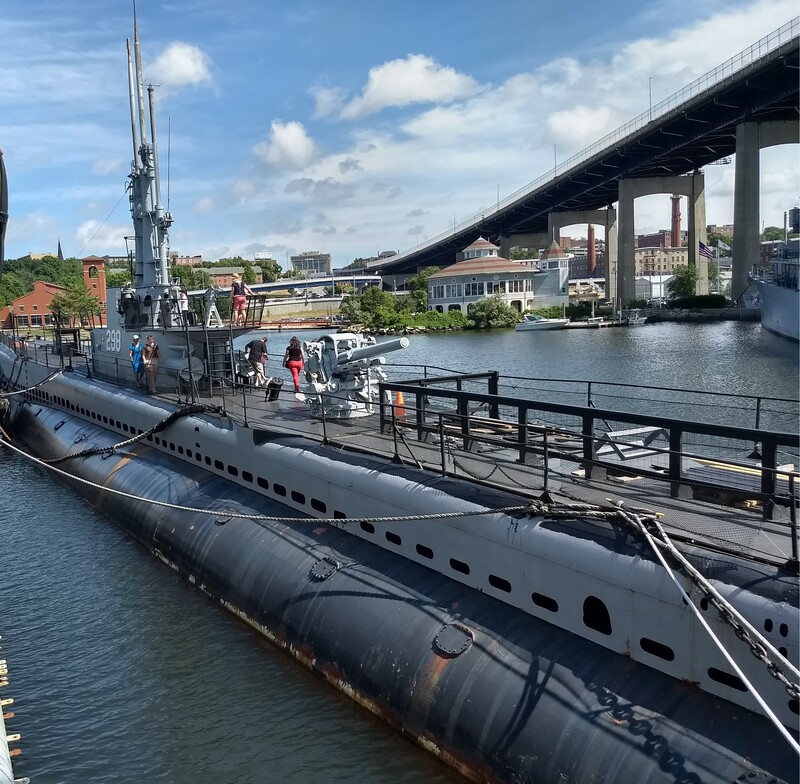 While in Boston visiting Sister Bean, we drove down with a couple of friends to Fall River, home of the USS Massachusetts. I'd been in touch with the crew on the ship, and ended up meeting up with one of the people there, who took the day from good to incredible. 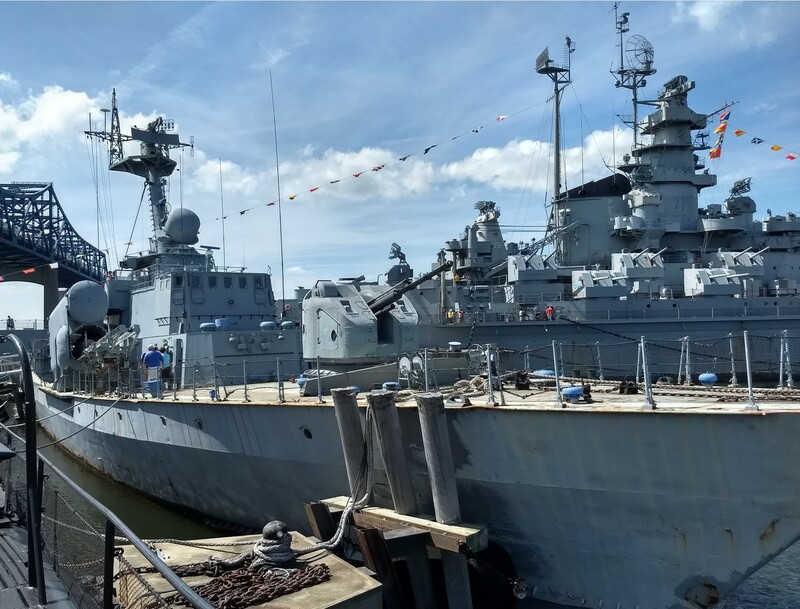 Battleship Cove has four vessels. Besides Massachusetts, the only surviving US battleship to have fought another battleship,2 there was the destroyer Joseph P. Kennedy Jr., a Gearing class destroyer modernized in the 1960s for anti-submarine warfare, the submarine Lionfish, representing the fleet boats that strangled Japan, and the Hiddensee, a former East German missile corvette. 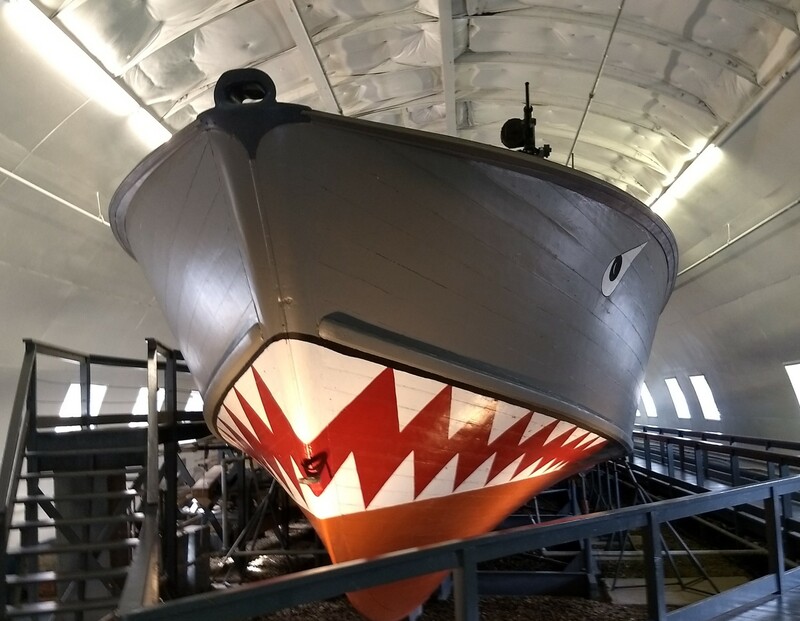 There are also a pair of PT Boats on display nearby, PT-617 and PT-796. While the special tour I got made the visit particularly impressive,3 Massachusetts would have been well worth seeing without it. Much more of the ship was open than on Iowa, and she was in something reasonably close to WWII configuration,4 so that was very neat to see. Particular highlights included the inside of Turret III, the barbette for Turret II, and the engineering spaces, all of which were displayed pretty well. The signage throughout was pretty decent. It wasn't perfect, but it was definitely a major step up from that aboard Alabama. A lot of the spaces were glassed off, which I don't like, but I can see why they did it. They'd definitely done a lot to restore the ship, given the condition they got the ship in,5 although some spaces had been gutted that I (and the crew I was with) wish they hadn't. There were a few hidden gems, such as Fritz-X guided bomb, which is an important weapon in the downfall of the battleship, although for some reason it's painted blue, as if it was a training weapon. Another interesting thing they had was the nose of a shell they'd fired that was recovered from Casablanca city hall after bouncing off Jean Bart. I didn't do all of the exhibits on battleships in general and Massachusetts in particular, because I was more interested in seeing the other ships in the cove. The rest of the ships were decent supporting acts to Massachusetts. Kennedy was much more accessible than Cassin Young. The engine room was open, albeit with too much glass, and most of the living spaces were also visible. My biggest complaint was the signage, which was uniformly pretty weak. Most spaces were unlabeled or nearly so, and there certainly wasn't enough explanation of the interesting and important role the late-war destroyers played in the Cold War fleet. They did have a pair of DASH drones onboard, which I enjoyed seeing. Lionfish was a typical fleet boat, much like Batfish or Drum. As it was my second one in about six weeks, I was underwhelmed, particularly as the signage wasn't that great, and the use of glass was even more extensive than on Batfish. 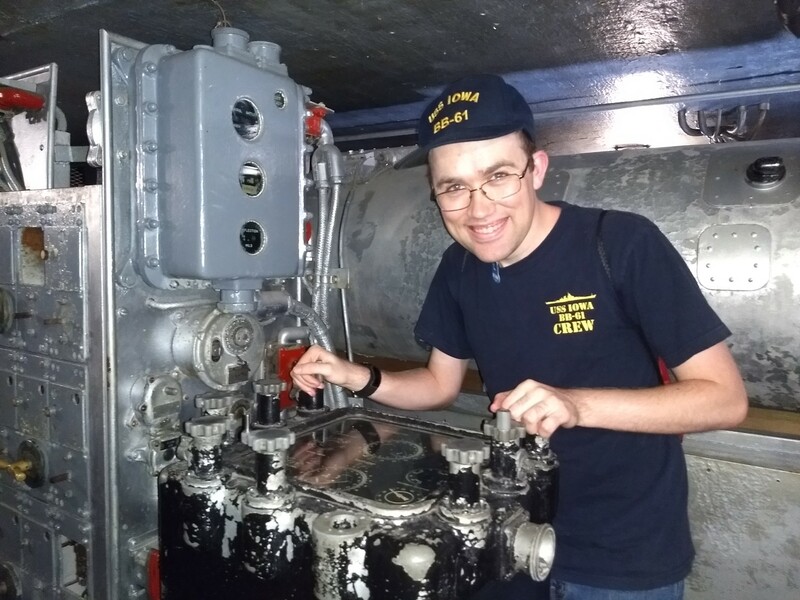 One positive factor was the ability to see inside the conning tower, but the torpedo data computer remained stubbornly out of sight. 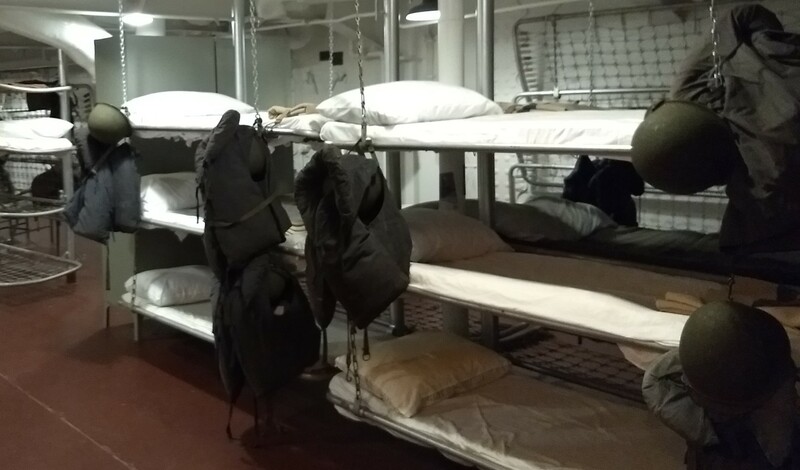 Even worse, the enlisted berthing compartment had been totally cleared out. Hiddensee was in some ways the most interesting of the ships. 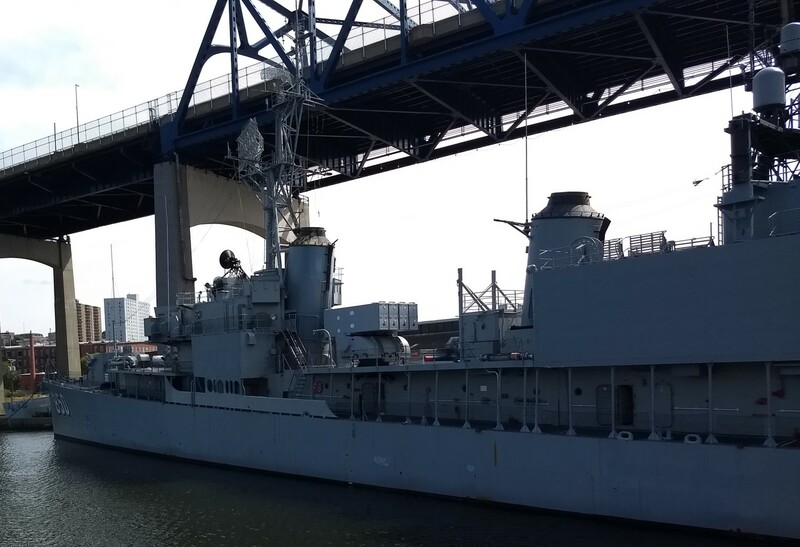 It was a missile corvette in the East German Navy, decommissioned when Germany was unified at the end of the Cold War, and bought by the USN for testing. A lot of the difference from the other three ships, all of the same era, comes from the smaller size and shorter endurance of the corvette, but there were a couple of layout choices that were obviously different. I wasn't quite able to see the differences in design philosophy beyond those revealed in gross weapons fit, but that probably just means I need to read more on Soviet-bloc warships. The PT boats were inside a shed, and seemed to be nicely preserved. Unfortunately, we couldn't go on deck or inside, and the holes cut in the side to let visitors see in weren't really big enough. I'm not a huge fan of either PT boats (basically a place to dump people who were too much trouble for the real Navy to deal with) or JFK (whose Secretary of Defense managed to ruin pretty much everything in the defense world), but it seemed a good memorial to the men who fought the Axis in wooden boats. 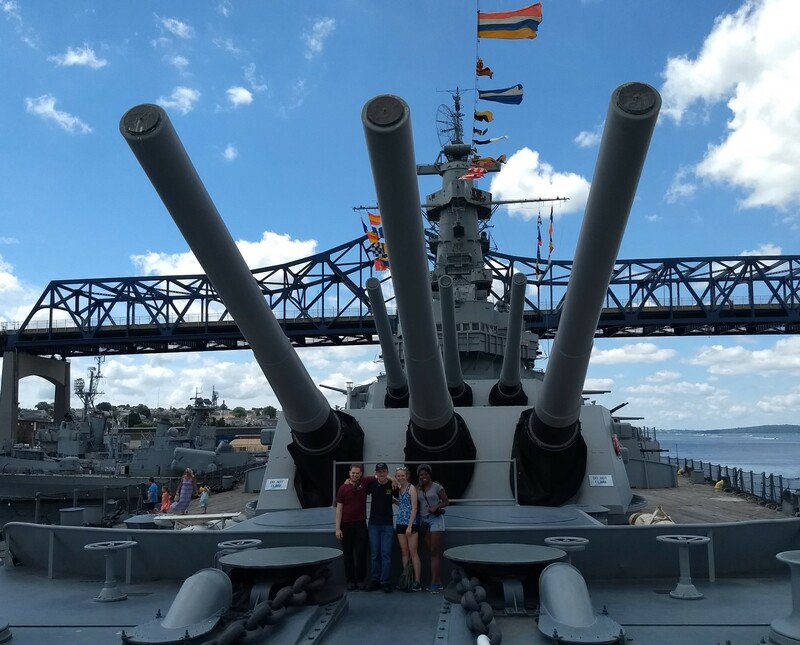 Overall, Battleship Cove is very much worth a visit. The presentation of the Massachusetts herself is quite good, and while none of the other portions of the facility reach the same standard, nowhere else in the world can you find a collection of ships that matches it.